So a while back Aero ran an online competition to let the public choose their new flavour for 2014. The options were strawberry, lemon, cappuccino or white. Now if I'd known about the poll at the time my vote would have gone quite contently with cappuccino, coffee is a much underused flavour when it comes to confectionary, and it's rich tones work like a dream with the sweetness of chocolate. Alternately the fresh and fruity option of either strawberry or lemon sounded like they to would bring something new to the market. Fruit and chocolate sound very summery and fun. So what won then? White chocolate, wow what an adventurous lot us Britain's can be, we went for the plainest sounding flavour. Oh well, I don't have anything against white chocolate it is just that I was hoping for something a bit more daring for a new limited edition. First things first once the wrapper was off I was a little more confused as I was met with a bar that looked like a regular milk chocolate Aero, it was only the bubbles inside that were white, the outer coating was still milk chocolate. 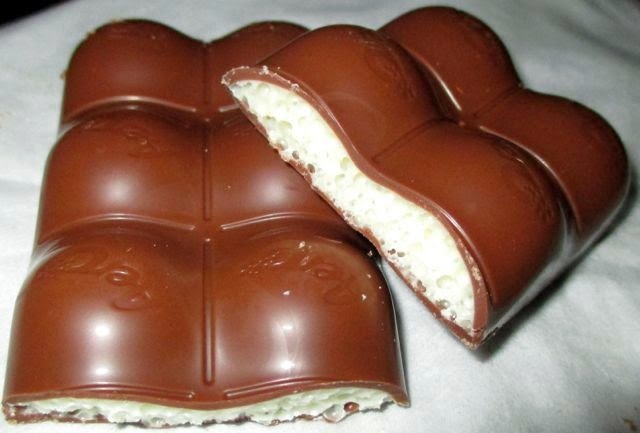 If we are going to have a white chocolate edition Aero it would have been nice if it had been pure white chocolate. Okay so flavour wise I can't complain, the bar tasted sweet and creamy and had a nice hint of white chocolate mixed in with the more dominant milk chocolate flavour. I love the texture of bubbly chocolate, it feels firm and then melts so much easier than regular chocolate in the mouth. It is pleasurable to eat. I enjoyed this bar and I'd be lying if I said otherwise. It was really nice to munch on with a cup of coffee while having a lazy Sunday afternoon. It did hit the spot in terms of a sweet chocolate treat, it is just that it isn't a wow bar. When I see it I just can't help thinking about the cappuccino bar that never was too. Why can’t we have more coffee and chocolate bars? The Aero Cappuccino could have been out of this world.